Please let us have any photos and titbits of information that you would like us to share with other PT enthusiasts. Above are some pictures of my original Pink Triangle. 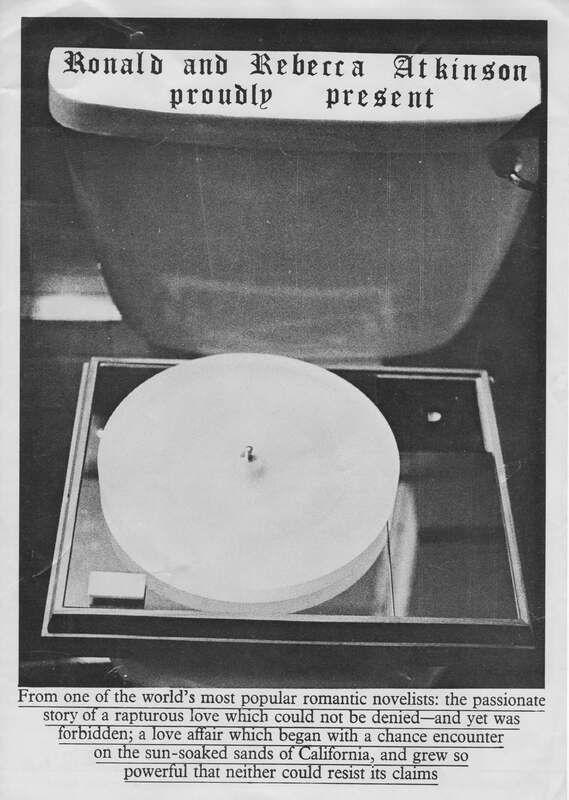 It was the first commercial sale of a PT deck, and was purchased from HiFi Connections in Beckenham in January 1981. It was ordered in late 1980. My girlfriend and I went to HiFi Connections to audition some decks. 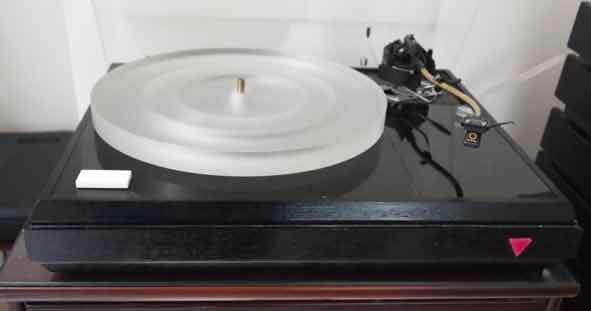 We listened to a Thorens TD160s, and a small Ariston (I believe, but could be wrong). Both were around the same price (£150-£160). 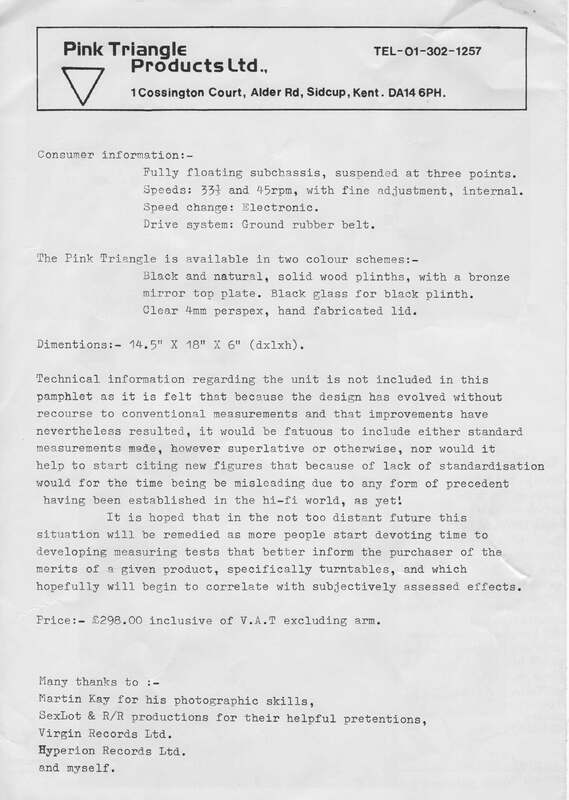 I remember asking what sonic gains were to be had if I spent more money on the more expensive Ariston. 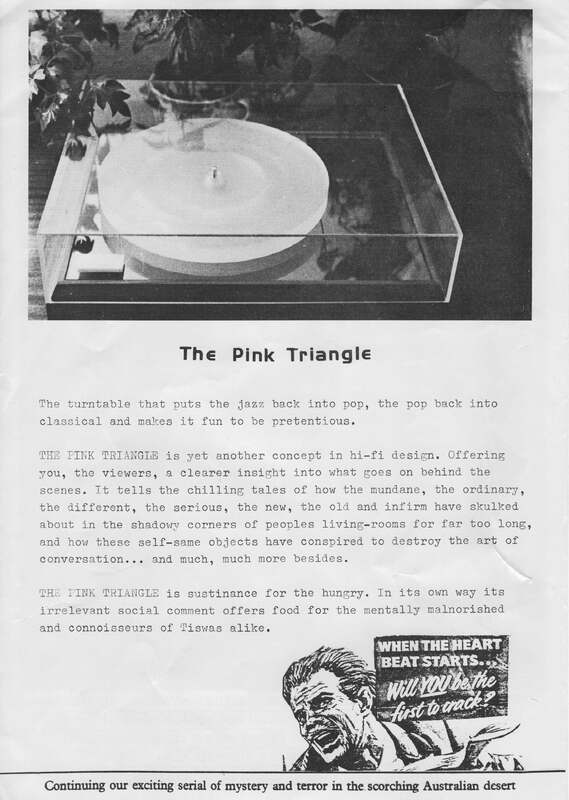 They told me that they didn't have one, but did have a new deck called a Pink Triangle priced at £200. Not only did it look fantastic but on first listen it was magic. We had been listening to one LP of a group whose name escapes me, and we both found them boring. As soon as the Pink was used, even that LP sounded good. I cannot remember which arm it had. It was to have had silver mirror glass as the top plate, but I was asked if I wanted the black mirror finish for an extra £10. The white slide switch controlled the on/off and speed 33/45. The deck was rebuilt early on by Arthur Khoubesserian when the suspension adjustment failed. He used chassis no. 029 for the rebuild (mine was chassis no. 002 and originally matt black). He also changed the spindle bearing for the jewelled version; the original was bronze. Much later, the motor went wrong and Pink Triangle Projects rebuilt the deck with an off-board power supply and an AC motor. The motor position was changed to the front left side. It was originally at the back right. The motor has now failed and I am going to have my PT rebuilt with a Funk Firm VX kit later in the year (when I can afford it!). The reason that I say the very early decks had the bronze bearing is that when the suspension collapsed, we went to Arthur and Neal's house and listened to the PT, while Arthur kept swapping the upper bearing assembly. He then revealed that the one that we liked better was the new jewelled bearing. 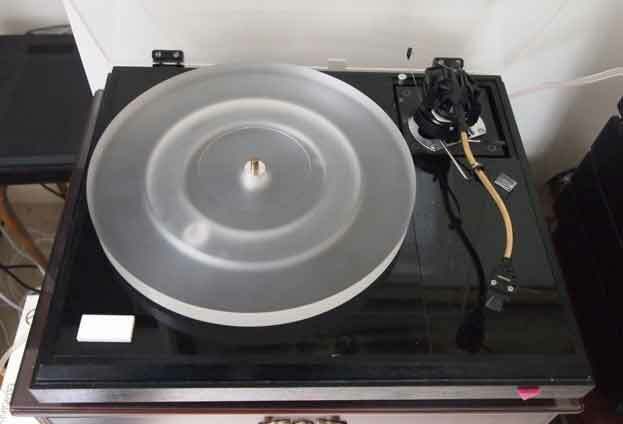 That was when he rebuilt my turntable using the later chassis. Late afternoon, we were joined by the chaps from HiFi Connections and went through the same procedure. In blind testing, you could hear the difference that the jewelled bearing made. I have also found an advertising sheet put out in 1981 entitled 'Ronald and Rebecca Proudly Present the 1981 Collection'. The deck still has the original SME 111s on it, and was originally fitted with a Goldring G900IGC. Currently using a Goldring 1042, which is no match for the G900. Anyway, the whole motor unit has packed up in the last few days, hence my thoughts about getting the Funk Firm to fit the VX kit. I want to try to get them to design something that retains the original slide switch. The article that I was reading was from High Fidelity, and is an interview with Neal Jackson and Arthur Khoubesserian by Malcolm Steward in 1990. 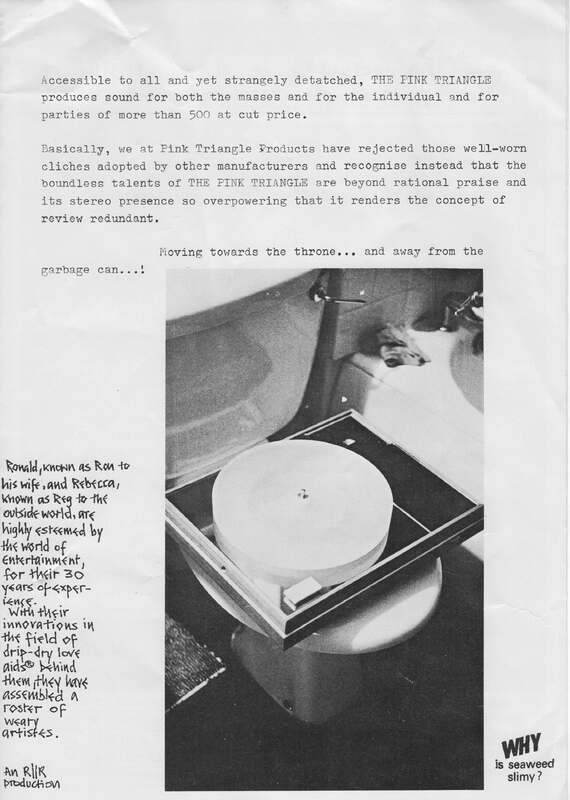 Attached are copies of the front, back and inside pages of a PT flyer. The flyer shows the early slide switch and also details the options for finish. I'll send them as two emails as the files are quite large. Front and back attached. We would like to thank Geoff Hawkins for letting us share the above information.